Whether you’re wearing it to stand out, or per its original purpose: to help you blend in, camouflage is as classic a pattern as stripes or polka dots. And despite what you might think it’s just as easy to wear too. Obviously the standard issue military motif gets along swimmingly with olive green chinos and rugged boots, but it’s also a great match for denim and knits in every color making it essentially a neutral you can mix and match with the rest of your clothes. So as long as you’re pairing it well with clothes that fit to flatter and following the basic rules of men’s style—stick to one bold element at a time, keep the rest of your outfit minimal in color and style, go for tonal colors when choosing clothes to compliment a pattern—you really can’t go wrong. 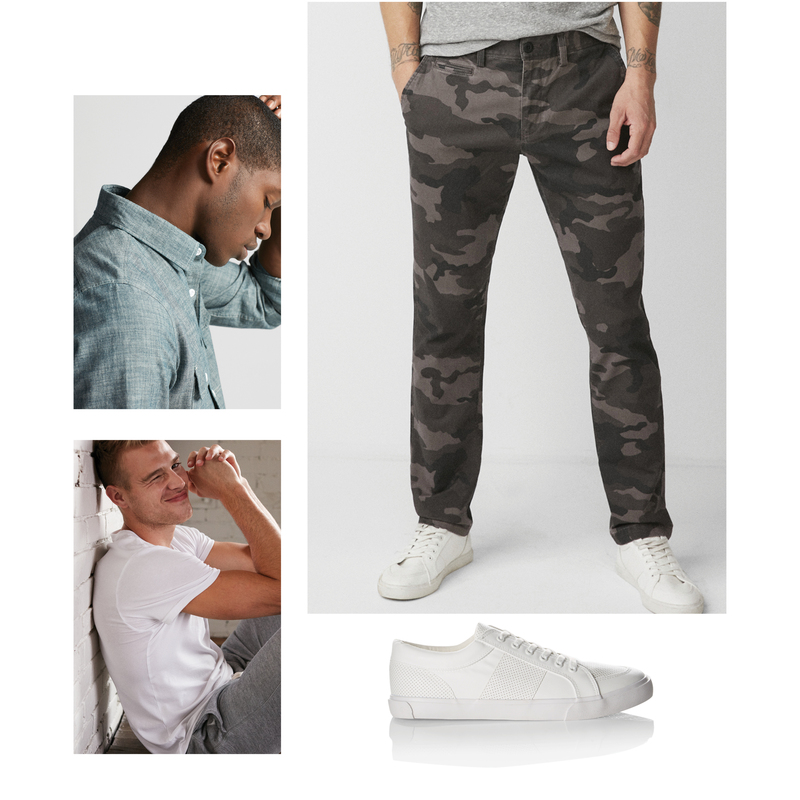 To help you get inspired this spring, or in case you’re too to do your own shopping, we put together five outfits, each one a more stylish way to wear camouflage than the last. There’s no big secret to wearing it well, but a dose of confidence and good posture never hurt. Spring weather is predictably unpredictable. So having a lightweight shirt jacket to throw on when the temperature drops or the wind picks up is key. Having one in classic olive green camo turns something practical into something fashionable. When your go-to fits consist of solid color basics (i.e. 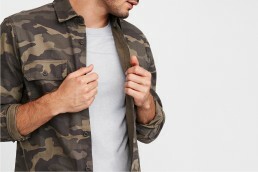 jeans and a tee), a printed jacket that exudes vintage military vibes is a big upgrade. And for guys looking to flatter their work-in-progress physique, this layering move has some serious belly-slimming power. 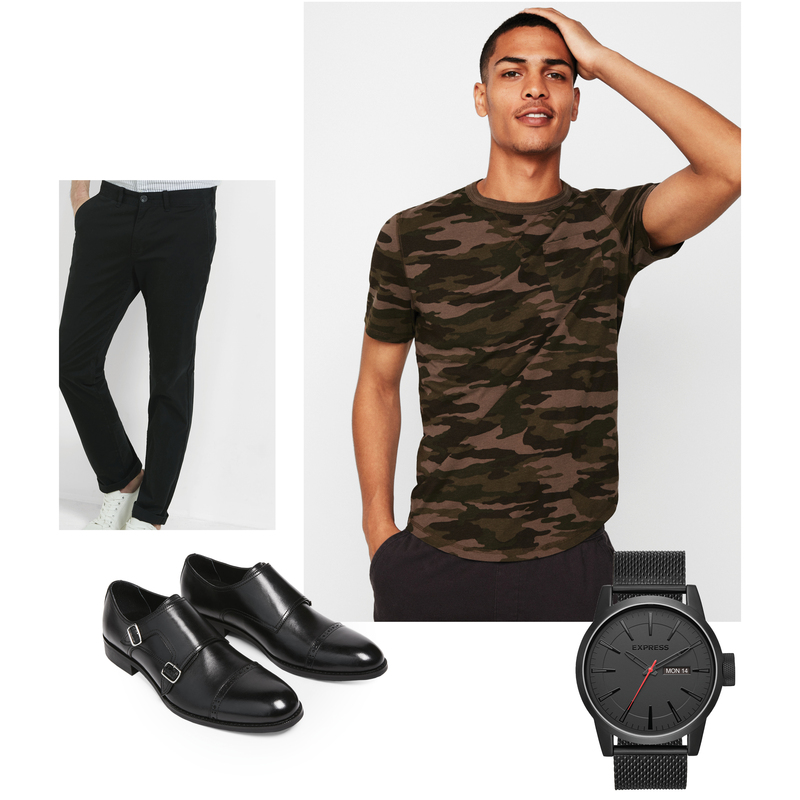 While showing up in head-to-toe fatigues might confuse your date, injecting your outfit with a subtle touch of military style is cool and manly. Embrace T-shirt weather with this dressy take on a casual fit. 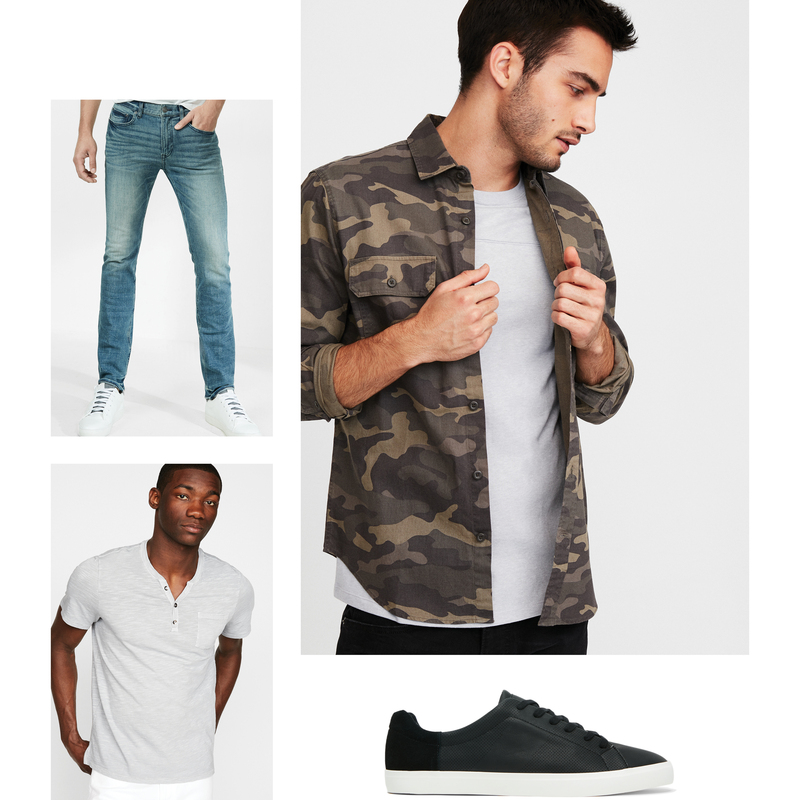 First, make sure your classic camo tee fits like a glove (there’s nothing sexier than a T-shirt that fits). Next pair it with dark tapered chinos, black monk-strap shoes and a tough guy watch in matte black. Wear it to the office Friday morning then right out to drinks Friday night. Not traditionally cosidered a dressed-up pattern, camo works best with a suit when it’s worn monochrome and a little washed out like this off-white camouflage raglan sleeve tee. Wear it under a rich brown suit to keep things tonal and offset the look with a slick pair of warm brown cap toe dress shoes. Want to make it even more special? Complement your suited look with a brown leather bracelet. When you’re hanging out with four of your buds, it’s easy to accidentally dress alike. After all, men’s casual clothing is a pretty narrow category of denim and chinos (not that there’s anything wrong with those). So next time you go out in en masse shake things up in the pants department. Your slim camouflage chinos will set you apart from Brian and Steve making it easier to attract the attention of that stranger across the bar. Pair them with easy-going spring essentials: white T-shirt, washed chambray workshirt, and some fresh sneakers. It’s finally it’s shorts season and that means trying out some patterned shorts. Camo is an easy first step because it won’t ever look childish. Our number one rule when setting your legs free: make sure they fit. You want the shorts to hit you between one and two inches above the knee. And because shorts can quickly turn from casual to sloppy, we’re suggesting you pair your pair with a short-sleeve button down and some canvas sneakers instead of a tee and sandals. This way you can go from brunch to beach to bar no problem. Just make sure you have some shades to protect your eyes out there.